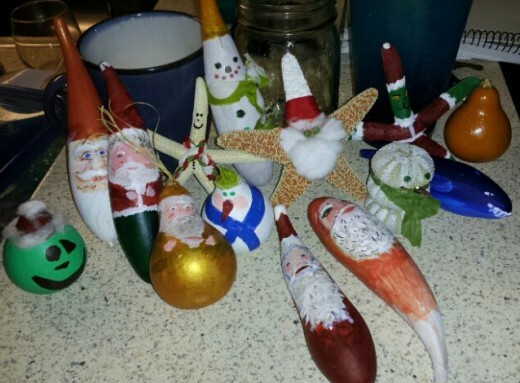 Each year, I set aside one evening during the Christmas season to spend making ornaments with my children and/or grandchildren. I've been doing it since my kids were little, and they're all grown up now, some of them even have kids of their own. Sometimes the holidays can get to hectic, it's hard to get everyone together, but we always make a special effort to make time for Ornament Night. We do something different every year. In past years we have made and painted salt dough ornaments, we have decorated tiny wreaths to hang on the tree, we have made reindeer ornaments from wooden clothespins and we have made beaded ornaments from kits I had purchased. We've made so many different types of ornaments, sometimes it's a challenge to think of something new. Last year I ordered some small, dried gourds on eBay thinking we could paint and embellish them for our yearly ornament project. There is a wide variety of sizes and shapes available at reasonable prices, and they are very light-weight which is a good quality in a Christmas tree ornament. I chose the banana gourds and the pear gourds which I think worked out very well. In a change from our usual habit, instead of spending Christmas at home the whole family traveled to my daughter’s house in southern California for Christmas. She lives near the ocean, and she had picked up some dried starfish and sea urchins to contribute to our project. It was nice, they added a little of the beach flavor to our sunny California Christmas. It turned out that supplies were a bit limited. We didn't have a lot of paint colors, or very much glue, so we had to make do with what we had. My daughter was determined that we would not miss out on our traditional ornament night, so we forged ahead. Santa Clause was a popular figure that evening. Skinny and fat, short and tall, starfish and gourd, it's surprising how each version of Santa has it's own personality. I especially love the starfish Grinch Santa at the top right of the photo below. Snowmen were another of our favorites. They are so easy to make. Simply painting your figure white, giving it a face and putting a scarf around the neck makes an amazing transformation. Most of our ornaments stuck with the traditional, but we had a few unorthodox creations, like the blue whale, and the starfish wearing a shell bikini and Santa hat. I think the golden pear (right next to the Grinch) made from a gourd is very elegant. We ran out to Michael's craft store early Christmas morning to see if we could find something to spruce up our creations a little bit. Lucky for us it was open and we picked up some sheets of foam beards, boots and hats which we added to wonderful effect. The little foam hats and the beard and eyeballs we got at Michael's craft store added a lot to the simple figures. 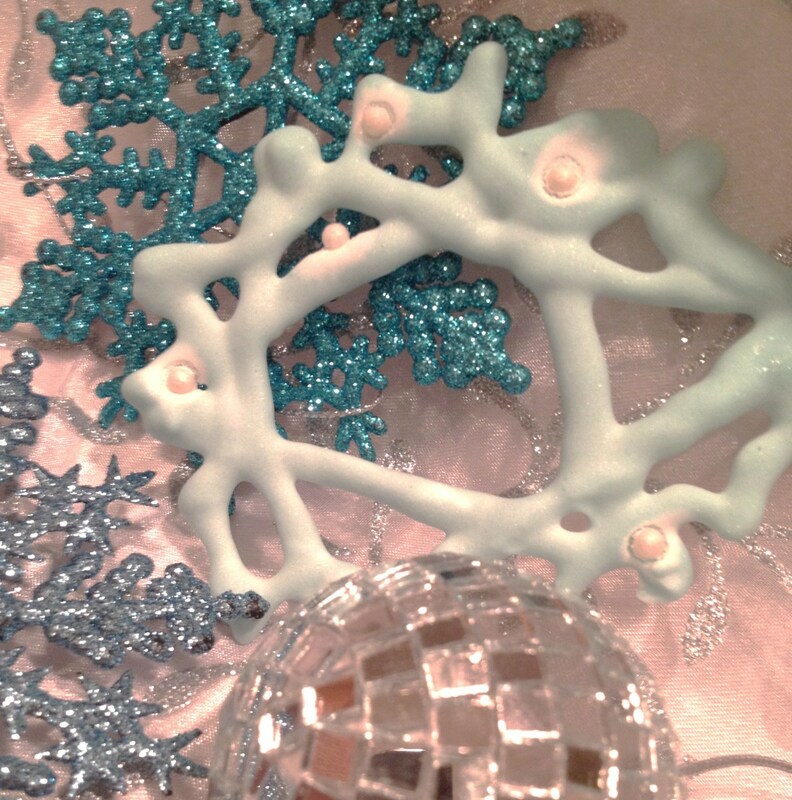 Do you make your own Christmas ornaments? Even though ornament night was squeezed in at the last possible moment, I would still call it a smashing success. All of our artwork was universally admired by all who saw it. Stockings are huge at Christmas time in my family. Even the adults all get one. I usually give everyone a homemade ornament in their stocking. What do you think of my crafty ornaments? Kalmiya - That was actually something I had in mind when I bought the gourds off of ebay, but I never followed through with it, and ended up just using them for personal use. Thanks for the suggestion though, I'm glad you think they're good enough to sell. 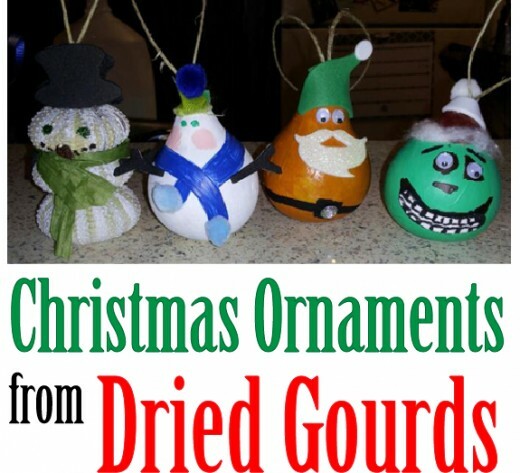 Your gourd ornaments are really nice! Have you thought of opening a store on Etsy and selling them there? They're really unique. Neat hub and voted up. Thank you Suzanne Day, I think they will be quite durable. What lovely and interesting christmas ornaments for the tree! It looks like they would be quite long lasting too, and I like the idea of handpainting beautiful faces and clothes onto them. Thanks so much for stopping by Peggy W. With all the ornaments we've made there's not much room for store bought ones. 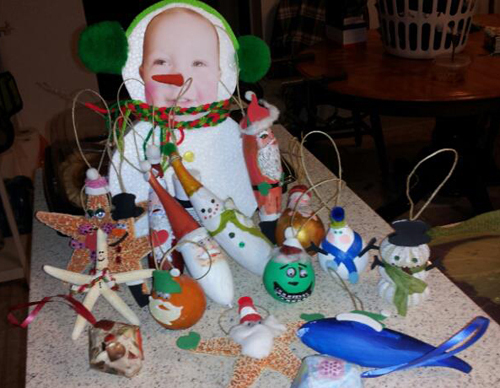 What a great tradition of making homemade ornaments each year. I remember when we were young children much of our Christmas tree was filled with homemade ones. Fun project for families to do together! 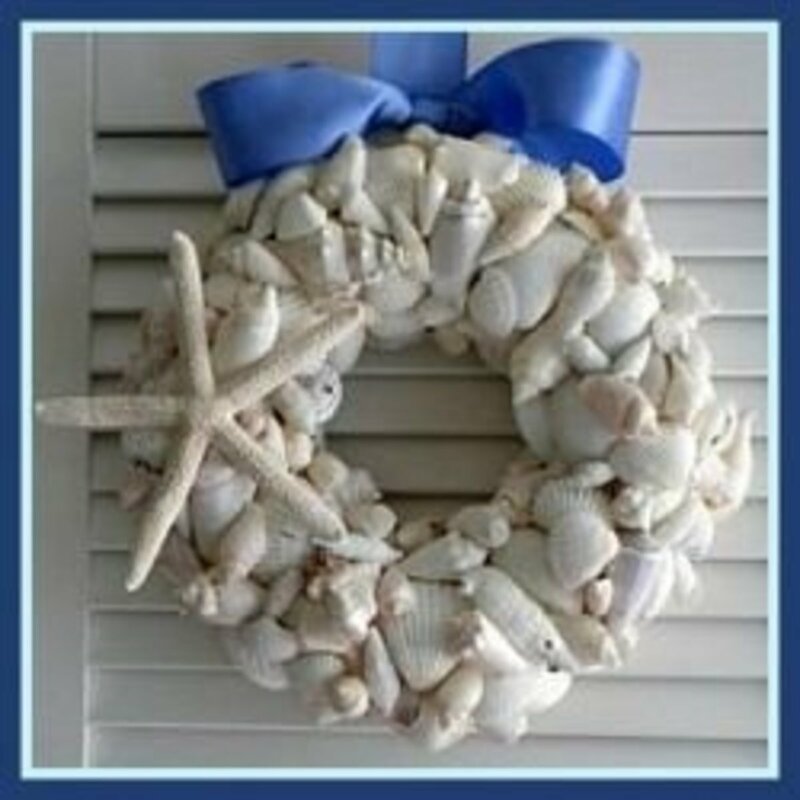 I have not made a Christmas ornament in several years but you have great ideas here if I want to start one day! Useful! How creative you are! Love learning how to craft for Christmas. I'm on my way to read your hub on "clothespin Reindeer." Thanks for sharing! I love your idea of the blue whale, that would go great with our Florida tree theme for Christmas. You are so creative and thanks for sharing this low budget idea with others. 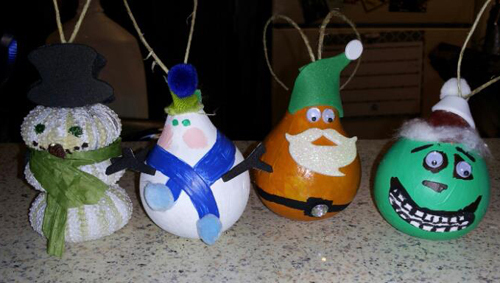 @Just Ask Susan - the gourds worked out great, I'm sure there are lots of other types of designs they could be used for too. Thanks so much for the shares. @tirelesstraveler - I hope so too. Sometimes if you just get started when they're there the boys will join in, my son did anyway. I am hoping my granddaughter will like traditions like this. The boys are hard to get motivated to craft. These ideas are awesome! Your grandson looks so happy among all of the fun creations. How creative! I love this hub as I've been looking for some new ways to make ornaments and using gourds is such a great idea. Pinning, sharing, voting up and more. I appreciate it Denise Handlon. I guess it's time to start figuring out what we're going to do this year. What a great idea, Sherry. I would not have thought of using gourds. 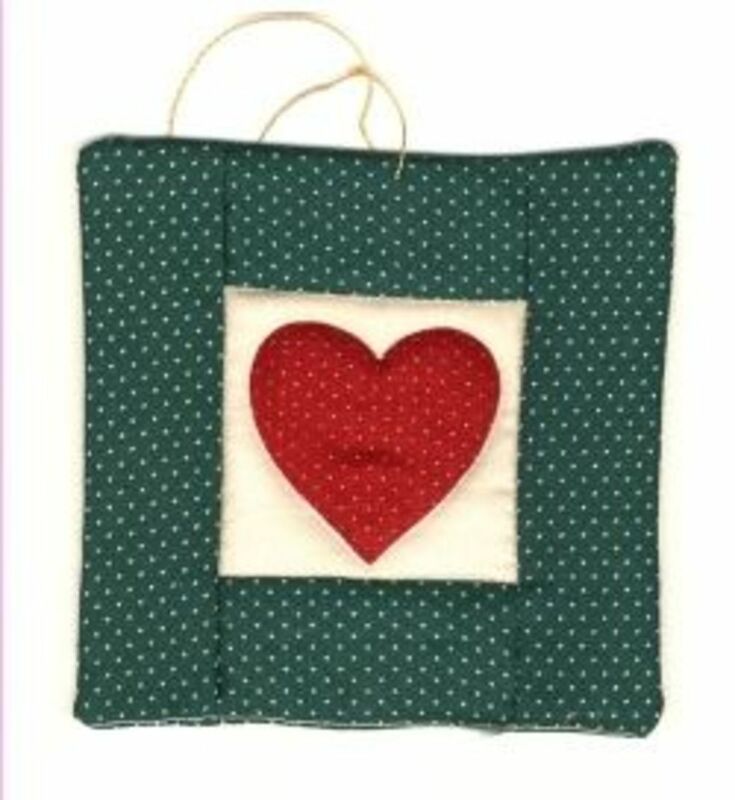 Passed it on to my Pinterest Craft board. I love the painting...you must be very talented, my art work would not have the same results! 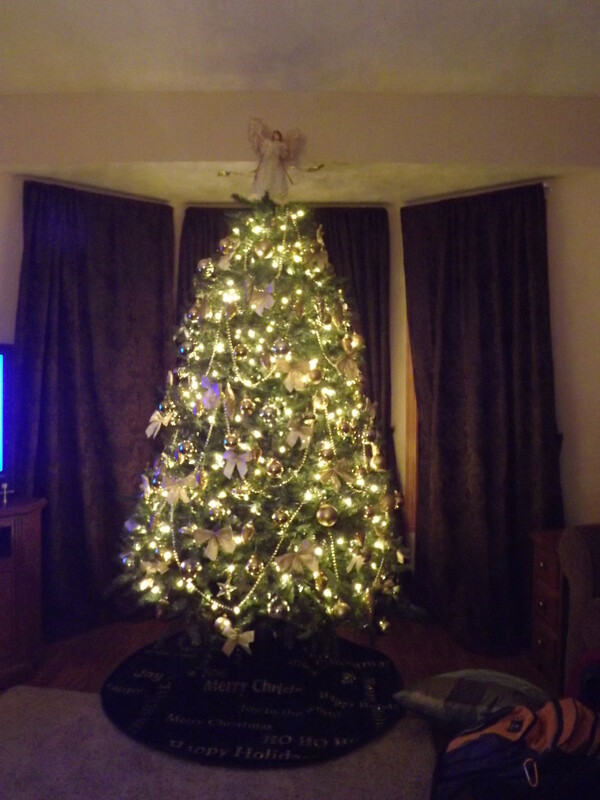 Beautiful work, and what an awesome family tradition you've started. Thank you billybuc, it's so much fun too. In today's economy I think we will see more and more of a need for this article and others like it. Well done Sherry!